In honor of Breast Cancer Awareness Month, I think it apropos to honor an inspiring woman, Maimah Karmo, who not only battled with the illness but has taken her challenges and built upon them to educate and support others. She is the Founder and CEO of the Tigerlily Foundation and an eight year survivor of breast cancer and she shares HERstory in her own words with us. Maimah Karmo with her daughter, Noelle. “In 2006, I was diagnosed with aggressive breast cancer. I was 32 years old and had a 3-year old daughter. When I initially went to the doctor, I was told I was too young to have breast cancer and my mammogram came back false negative. The doctor performed an aspiration, which was unsuccessful, but she insisted that I come back in six months. In the meantime the lump doubled in size and I began experiencing overwhelming fatigue and night sweats. When I went back, she insisted on a re-aspiration. I pushed for a biopsy and was diagnosed the next day, on February 28, 2006, with aggressive breast cancer. I had a lumpectomy, then chemotherapy and eventually radiation. I watched my hair fall out and the weight peel off my body. While undergoing my second round of chemotherapy, I would ask why this was happening to me. I was so afraid of the future. I had no family history of breast cancer. I lived a healthy life and could not understand how or why this was happening to me. One night I made a promise to God that, if he restored my spirit, I would give my life to him in service. The next morning Tigerlily Foundation was born. I had learned that approximately 13,000 young women get diagnosed and approximately ten percent of those women die because they were originally misdiagnosed. I thought of how many other young women were going through what I was experiencing. That was the moment I stopped asking why and began thinking how and what I could do to make a difference. Tigerlily Foundation’s mission is to educate, advocate for, empower and provide hands-on support to young women – before, during and after breast cancer. What started as a promise and a dream is now a nationwide organization reaching thousands. The foundation provides education and empowerment to young women and their families, we educate healthcare practitioners, we provide peer support to newly diagnosed young women, we send young women in treatment breast cancer buddy bags, meals, we pay their bills, and we provide support to young women living with Stage 4 breast cancer. I run the foundation while working a full-time job and being a single mother and these are some of the reasons why. I do it because if it were not for the grace of God and a mother who taught me to do my breast exams at thirteen, I wouldn’t be here. I do it because I am humbled to do this work and because I believe that when one is blessed with life, in some way, we must be of service to others. I do it because I promised God that I would create something that would make a difference in the landscape of young women and breast cancer. I do it because I promised my daughter that I would live – and I meant not just physically, but be truly alive – thereby giving her a legacy that would never die and hopefully an example of the importance of creating the life you want, pursuing your dreams, embracing life, loving the moment and walking along a path because you believe in something deeply, even if you can’t clearly see the way ahead. I do it because young women are needlessly losing their lives to a disease that many of them are not even aware they may have. I do this work because breast cancer floored me but I made a decision to pick myself up and be even better than before. I do it because I want other young women who are diagnosed to know that they have somewhere to turn for support, love, empowerment and services. I do it because I want women to know that they can survive and thrive. I want young women who have not been diagnosed or misdiagnosed to know that they have a right to life and that they need to exercise their personal power and become their own best advocates. I will do whatever it takes to ensure that every young woman is aware of the issue of breast cancer and I’ve dedicated my life to ensure that this happens. I do it because it is important to be living examples to our children. When my daughter was six, she woke me up one morning and asked me what she could do to “help the women too”. She asked me if she could have a fundraiser. The week she started first grade, she began planning one along with several of her friends. At six years old, they knew that they can make a difference. It started with a pajama party event in Washington, DC to educate young girls and mothers and it has now spread to New York, NY. In 2012, my memoir “Fearless: Awakening to My Life’s Purpose Through Breast Cancer” was released. Breast cancer, to me, was a catalyst and reminded me to live my life on my own terms every day. I’m truly thankful to be alive and to be in service to others. As tough as it was to go through breast cancer, I know that my challenges can help others to know that they too can get through this disease. To me, I’m really just a girl who got breast cancer and, after my life got turned upside down, I knew I couldn’t just go back to life as normal. Somehow, through it all, I have found my purpose and want to help other young women as well – in the world of breast cancer and in life. Everyone has someone or something that motivates them and pushes them when they’re exhausted and feeling like they can’t go on. For me, it was my then 3-year old daughter, Noelle. She is now 11! I’m so thankful for every day I get to be with her and watch her grow up. The Tigerlily Foundation’s 6th Annual EmPOWER Ball will be held on November 8, 2014, from 6:00 p.m. – 11:00 p.m., in Reston, VA, to honor individuals making a difference in the world of breast cancer. To learn more about the Empower Ball, buy tickets, sponsor, advertise or to honor a breast cancer survivor, visit our EmPOWER Ball website. 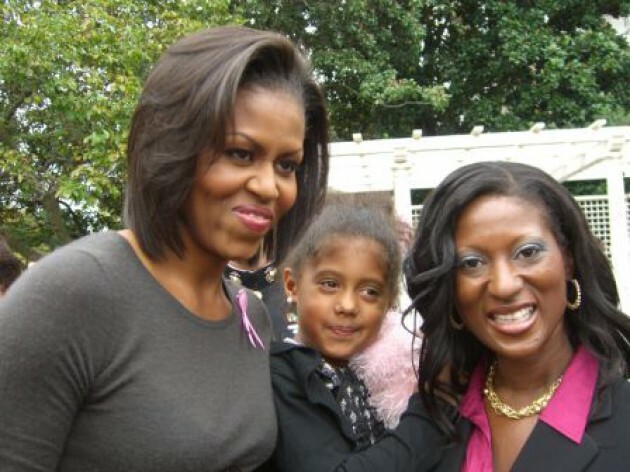 This entry was posted in Daughter, Inspirational, Mother, Women and tagged breast cancer, breast cancer survivor, herstory, humanitarian, inspiration, Inspired by my mom, inspiring story, Maimah Karmo, Michelle Obama, Mother, Tigerlily Foundation. Bookmark the permalink.